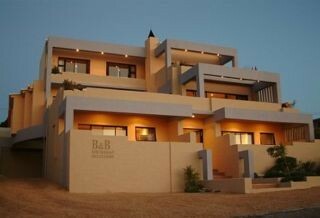 Marebella is an owner run luxury guesthouse in De Kelders overlooking Walker Bay. 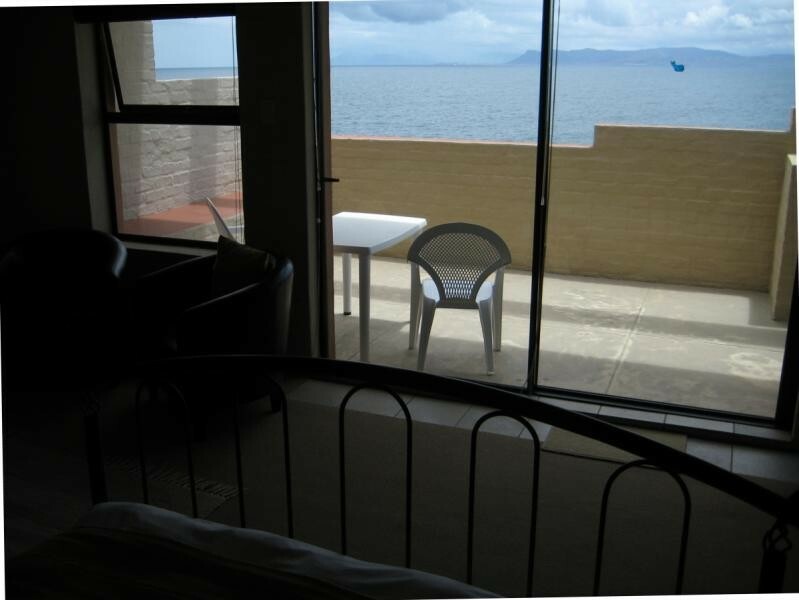 Marebella rooms are right on the seafront, spacious and have their own large private seafront balconies. German spoken. Free WI-FI. Experience the relaxed atmosphere at *Marebella* where Mediterranean living meets South African hospitality. 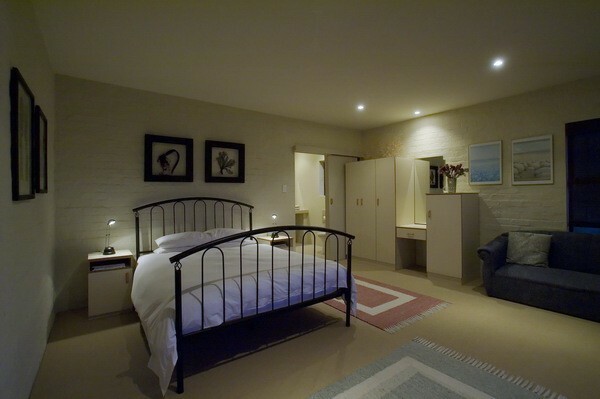 Stay in spacious guest rooms on the seafront, overlooking the cliffs of De Kelders. 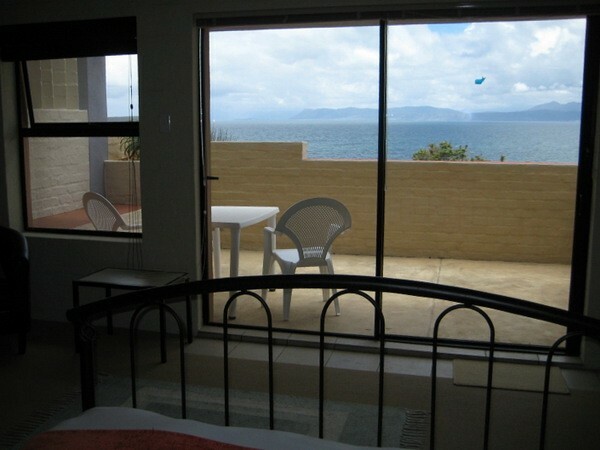 Our rooms have 180 degree uninterrupted panoramic views of Walker Bay. 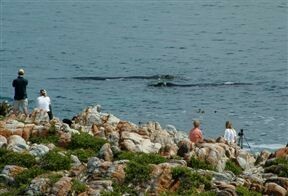 Whale watching from your room and private terrace from August to early December. De Kelders is quiet and peaceful - a nature lover's dream. Attention to design detail results in the successful blending of Mediterranean and Art-deco styles. Our passion for light and space mean few doors, wide archways and open-plan living. Designed to make the most of the sea views, floor-to-ceiling windows line the front of the house. 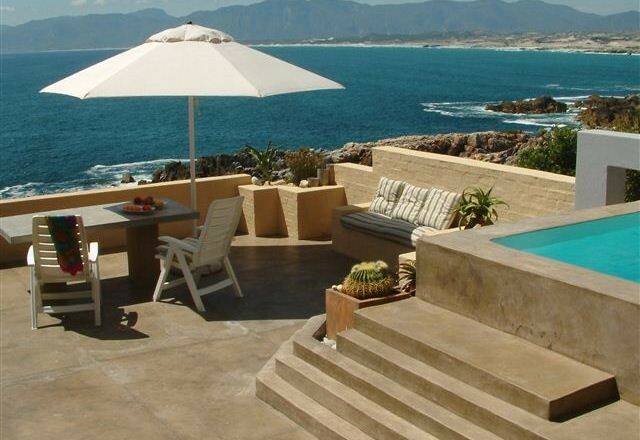 The sundeck looks over the ocean and the Hermanus mountains. Feel like Robinson Crusoe on the stretch of endless unspoilt sandy beach called 'Die Plaat'. Gerhard will take you swimming in the natural rock pools and walking along the cliff path to explore the caves of De Kelders. 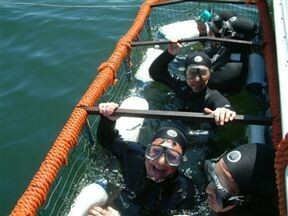 For the adventurous there is Great White Shark cage diving at 'shark Alley' off the coast from Gansbaai, horse-riding on the beach, scuba diving, 4x4 trips into the surrounding mountains and more. We can arrange these adventures at discounted rates. 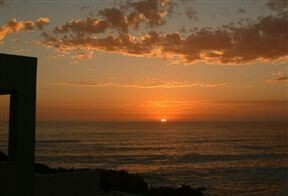 Watch spectacular sunsets over to the Cape of Good Hope. 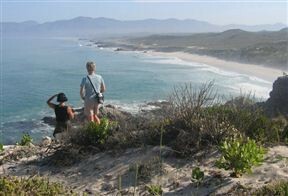 Marebella is 30 minutes on the R43 from Hermanus on the route to L'Agulhas and 3 km from the fishing village of Gansbaai.